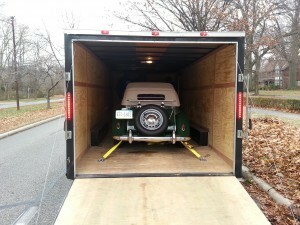 Often times, as we prepare for a big move it may seem like the best decision to sell your car, truck or motorcycle. The prospect of auto transport or storage services may seem expensive or daunting, and selling is a common solution! However, this presents new challenges, and new stress when you arrive at your final destination or return from a long period of time away. Looking for a vehicle in a new city can be time consuming and stressful, and for some – it may not make sense to sell your vehicle at all! This is where we come in! Moving Ahead Services provides professional auto transport as part of your move, or if you simply want to transfer your car from one location to another. Our expert car movers are trained in safely operating car trailers, including both open and closed trailers depending on your specific preferences. We also provide both short term storage and long term car storage, to accommodate temporary housing situations as seen in military moving, contract work or overseas work. Check out all of your options before you make a choice, and be sure that you have all the facts before deciding what to do with your vehicle or motorcycle. Moving Ahead Services is a full-service moving company, providing individuals and businesses with relocation and storage services, and so much more. Our trained professionals in the office and in the field aim to make every single move an efficient success. With over a decade of experience, we have what it takes to provide an affordable, safe move for your belongings. Plan your long distance move with Moving Ahead Services, and let us help you navigate the options when it comes to car transport pricing and services, or car storage options. Contact our offices in Cleveland and Columbus for a free quote, expert advice and more! Affordable car movers to relocate your vehicle during a long distance move.